What a week! Last week was kind of a roller coaster of emotions. 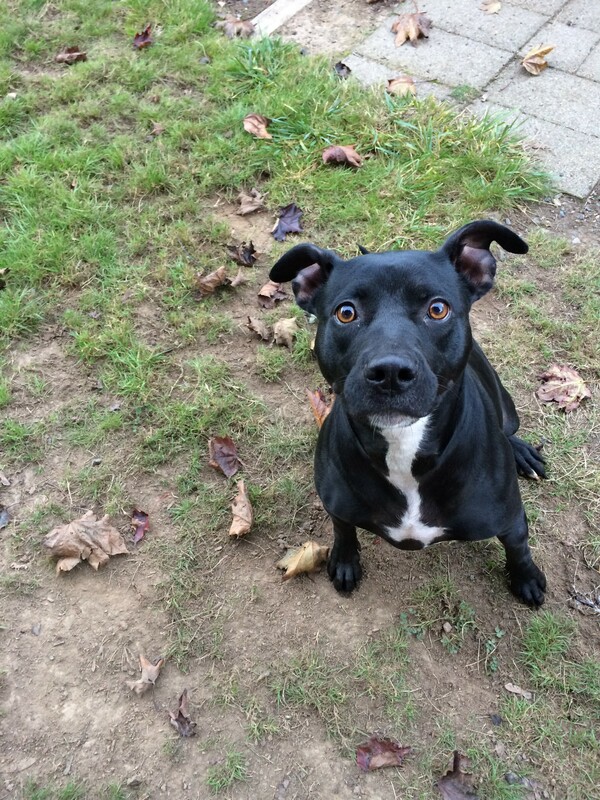 My week started with an annoyance…I had to wear a heart rate monitor for 24 hours. I was having issues with heart palpitations off and on–which my doctor said can be a normal part of pregnancy because of increased blood levels, lower blood pressure, etc. She didn’t seem too concerned about it and gave me the option of either wearing the monitor, or waiting to see if they go away. Michael panicked a little bit. 🙂 So I wore it. 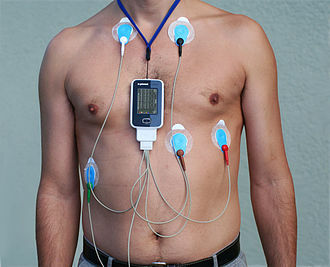 And then the device hooked to my waist (about the size of an iPhone). I was supposed to hit a button on the waist device whenever I felt a palpitation or got dizzy. Then I had to keep a paper journal of what time the event happened. Of course the 24 hours I wore it, I barely had any symptoms. I got to take it off Tuesday evening–thankfully! The sticky pads kind of irritated my skin, it was a nuisance to wear and I felt self-conscious wearing it. It takes about a week to get results. I’m not too worried. I’ve had my heart checked before (a regular EKG) and everything was fine. Thursday we finally had some free time and could actually spend it together so…date night! We let Bella stay out of her crate (we’re still testing her again) while we went out to dinner. We went to Fillmore Coffee in NE Portland. I’ve wanted to go for awhile now because a coworker’s husband is the owner and she’s been telling me about the place for months. She gives me updates on the rotating beer taps (before she knew I was pregnant) and I wished I could actually partake! The rotating taps are great! All local beers. Michael got the Double Mountain Killer Green IPA. 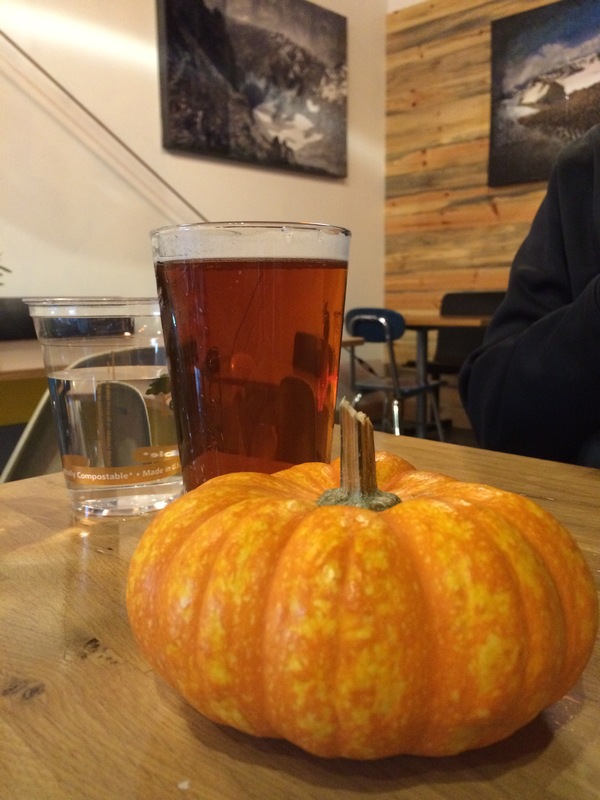 (ABV 7.6%, IBU:96) He said it was outstanding. I’ll take his word for it. Double Mountain is usually a great beer, so I trust his opinion. They also had a few other local beers and a cider on the menu. 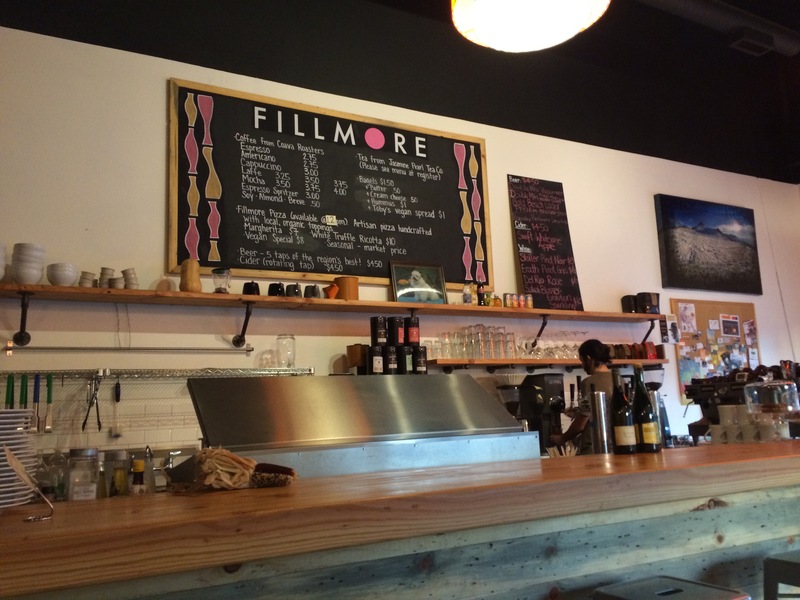 So Fillmore is a coffee shop with a little bit more. It’s a big, open space with concrete floors, cool art on the walls, high warehouse ceilings and repurposed wood on the walls and bar. Nice jazz music mellowed out the mood. They have coffee, tea, beer, wine, cider. Plus they have some pastries, bagels, etc. The menu is small and simple–and all vegetarian or vegan. They had half a dozen pizzas on the menu to choose from and a few salads. 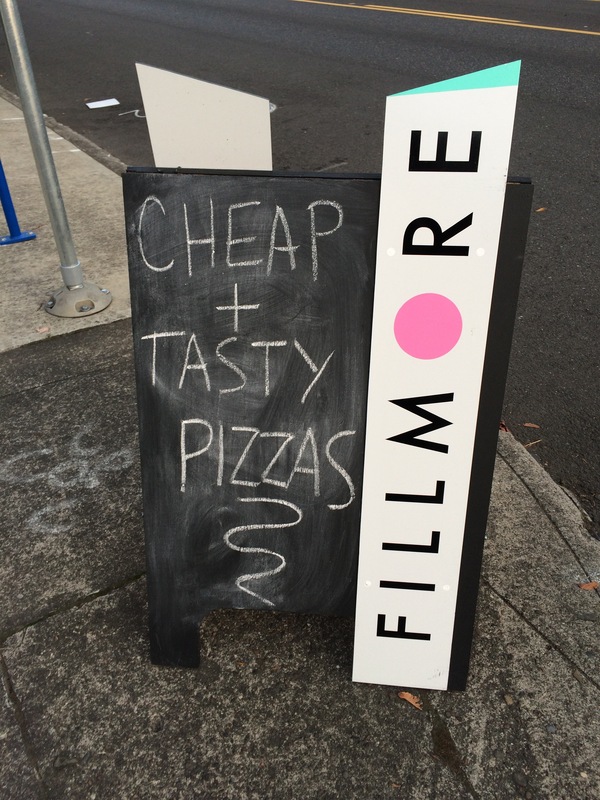 The pizzas are super cheap, too. We ordered the spinach salad to share and the White Truffle Oil Ricotta Pizza. My coworker has been raving about this pizza for months and I’ve been dying to try it. First, the salad. Simple but fantastic. I know for a fact they get all their ingredients from a local organic place. The salad was fresh and delicious, full of flavor. 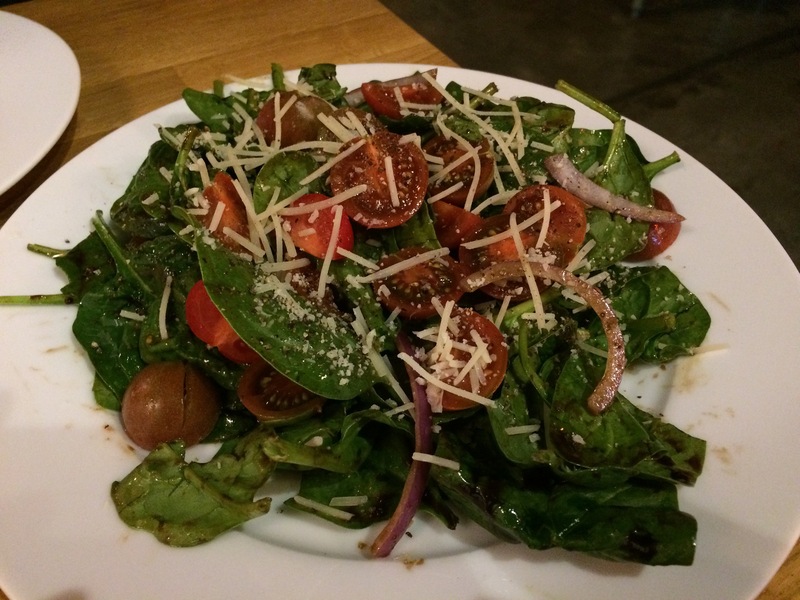 Spinach, tomatoes, red onion, cheese and vinaigrette dressing. Michael raved about the salad–especially the onion. He said it was the perfect red onion (crunchy and spicy, his words). I liked the salad a lot and wished we’d ordered two instead of sharing. We watched them make it, periodically rotating the pizza in the oven, and as he brought it to our table I could smell the garlic and truffle oil. It smelled heavenly. I guess the pizza chef used to work at Apizza Scholl’s (Michael’s favorite place in Portland) and the pie was very similar. It was small (6 slices total) and the crust was very similar to Apizza Scholl’s. 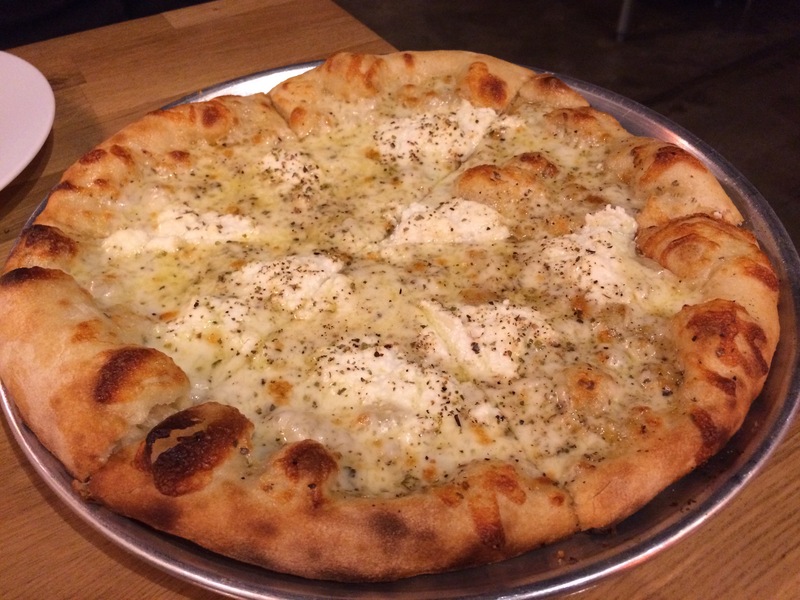 The dough was fresh, perfectly baked, the truffle oil was amazing (I love truffle oil). There was seasoning and ricotta cheese and fresh mozzarella–it was decadent. I am a HUGE fan of this pizza! We both agreed that we wished the pizza was slightly larger. While we both felt satisfied and certainly didn’t need any more pizza after eating the whole thing, we both WANTED one more slice… it was that good! 😉 Seriously, loved the pizza! I would definitely go back for this pizza and the salad, too. It was a nice treat. The place had a cool vibe and lots of local people came in to hang out and seemed like regulars. There was also one of those wooden train tables for kids to play with. There was a cute little toddler there having a ball with the train set. It was fun to watch (and we might need to get one of these things for our little nugget!). Shenanigans. I have no idea what they were getting into but I know when I walked in the door Bella and Fat Kitty were racing through the hallway. SIGH. 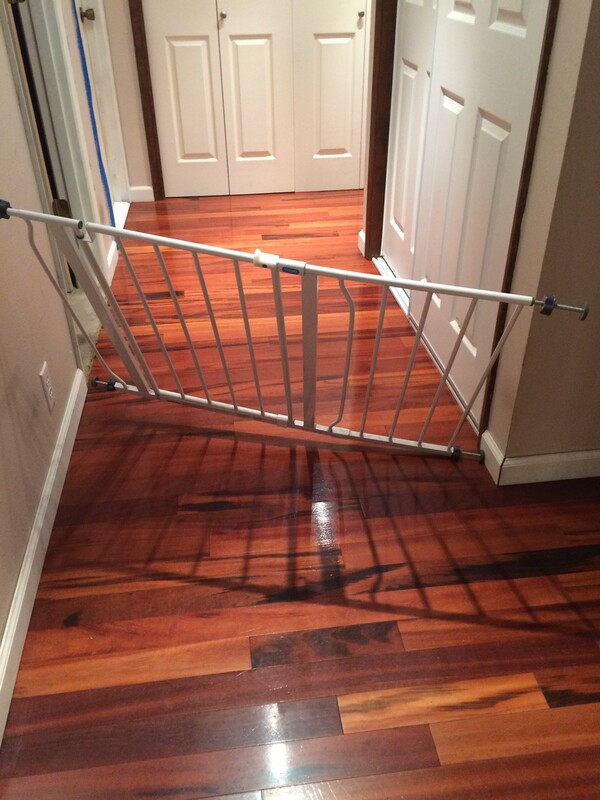 Chaos in our house. Always! Just wait, fur-babies, when there’s a real baby chasing both of you! I had tons of heart palpitations too, I totally forgot about that! I think they went away in the teen weeks? Mine started around like 14 weeks I think? They are slowing down now and not as frequent or as bad. I figured it was just a weird pregnancy adjustment.